We’d love your help. Let us know what’s wrong with this preview of Baltasar and Blimunda by José Saramago. From the recipient of the 1998 Nobel Prize in Literature, a “brilliant...enchanting novel” (New York Times Book Review) of romance, deceit, religion, and magic set in eighteenth-century Portugal at the height of the Inquisition. National bestseller. Translated by Giovanni Pontiero. When King and Church exercise absolute power what happens to the dreams of ordinary people? 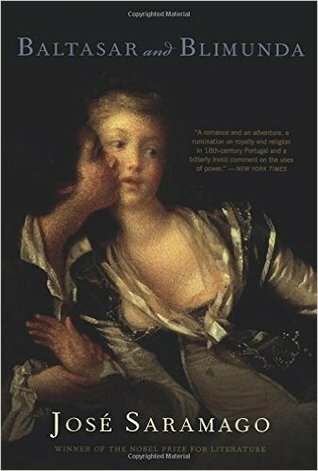 I From the recipient of the 1998 Nobel Prize in Literature, a “brilliant...enchanting novel” (New York Times Book Review) of romance, deceit, religion, and magic set in eighteenth-century Portugal at the height of the Inquisition. National bestseller. Translated by Giovanni Pontiero. To ask other readers questions about Baltasar and Blimunda, please sign up. “If Adam was punished for wishing to resemble God, how do men come to have God inside them without being punished, and even when they do not wish to receive Him they go unpunished, for to have and not to wish to have God inside oneself amounts to the same absurdity, and the same impossible situation, yet the words Et ego in illo imply that God is in If you're into stuff like this, you can read the full review. Baltasar and Blimunda (Portuguese: Memorial do Convento, 1982) is a novel by the Nobel Prize-winning Portuguese author José Saramago. 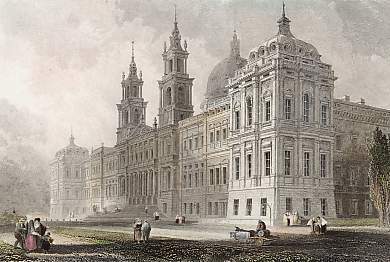 It is an 18th-century love story intertwined with the construction of the Convent of Mafra, now one of Portugal's chief tourist attractions, as a background. Two young lovers interact naturally with historical characters including the composer and harpsichordist Domenico Scarlatti and the priest Bartolomeu de Gusmão, recognized today as an aviation pioneer, all in the shadow of the Inquisition. The lovers are always at center stage wrapped in Saramago's language, which ranges from short simple sentences to surrealistic, unpunctuated paragraphs that help to intensify both the action and the setting. Baltasar and Blimunda revolves around the construction of the monumental monastery in Mafra, an effect of slyness of the Franciscans and vanity of the king of Portugal, Joao V. Thousands labouring workers to satisfy the morbid ambitions of monks and pamper bloated ego of the king remind us of builders pyramids in antiquity. Is it the ancient Egypt or the Catholic Portugal pride of kings and hypocrisy of clergy seems to be unchanged for centuries. Marriage of the altar and the throne always looked the same and the little people as ever were losers. People would kneel before the king, the bishop, the altar, the procession, the image of a saint. They would kneel so often that actually did not get up from their knees at all. Saramago is wonderfully ironic and blasphemous. And equally ruthless towards monarchy and clergy. He's irreverent when with wry humour is stigmatizing their sanctimony, greed, lecherousness and stupidity, he's sarcastic describing endless ceremonials, the institution of the saints and indulgences, and, what a heresy!, doubting in the divine order of the world. Meanwhile in the background unfolds unusual story, love of the crippled soldier Baltasar and daughter of woman condemned for witchcraft, Blimunda and their relationship with Padre Bartolemeu Lourenço who dreams of building passarola, the flying machine. To deny the law of gravity, soar where angels tread, look into the face of God ? Indeed, rather dangerous chimera in the time of the Inquisition. Baltasar and Blimunda , alternately brutally realistic and wonderfully magical, you can hear echo of magical realism here is a remarkable tale. Saramago’s style is quite distinguishable, extremely long, complex sentences, often without punctuation, with two narrators all at once. It requires a lot of concentration but it’s highly original and rewarding reading. Saramago perfectly balanced insatiable hunger for knowledge and questioning the established order of the world with power of love and man's character to create a powerful and visionary story of the human determination to pursue their dreams, overcome own limitations and rise above dreariness in times when life did not mean too much and people were burning like torches. Perhaps, the longest 343 pages I've ever tried to read, but very fulfilling in the end; a 5 star like no other that I've rated, 'Baltasar and Blimunda' is historical fiction at its base, but a satirical fairy tale concerning the hypocritical piety in early Modern Europe at its crux. The language and prose is not only shockingly comical (speaking of the queen as merely a receptacle for reproduction), but philosophical, brutal and beautiful. Also, with his usual 'non-quotation' dialogue, it makes it a bit dense and a slow read, but if you like Saramago, you know what to expect. In some parts, it feels slightly tedious due to the language, but in actuality it's the reader who needs to have patience; it will work itself out. The character development is superb and nothing is left to wonder, which, for this tale, is perfect. The ending is surprising, but fits. In these times of intolerance and superstition, King John V 'the Magnanimous' reign on Portugal and its subjects. the sovereign is a gentleman, he honors the convents of Lisbon and its surroundings very gracious presence and his good offices, so much so that a string of bastards born of his royal misdemeanors. Nevertheless João fulfilled his conjugal duties very scrupulously and periodically by honoring twice a week his wife, Queen Marie-Anne of Austria; Nothing does, the monarchical matrix refu In these times of intolerance and superstition, King John V 'the Magnanimous' reign on Portugal and its subjects. the sovereign is a gentleman, he honors the convents of Lisbon and its surroundings very gracious presence and his good offices, so much so that a string of bastards born of his royal misdemeanors. Nevertheless João fulfilled his conjugal duties very scrupulously and periodically by honoring twice a week his wife, Queen Marie-Anne of Austria; Nothing does, the monarchical matrix refuses to give the good king a descendant. So when a monk of St. Francis order promises the coming of an heir if he finally agreed to the request, the Franciscans renewed for dozens of years, to have a convent, the king promises. And what the king promises, he does and orders. Parallel to this narrative, far from the inaccessible heights where monarchs and prelates hang, the destinies of three principal characters are told to us. Starting with the most illustrious, I named Bartolomeu de Gusmão, the Jesuit prodigious memory, a kind of Pico della Mirandola of his time, and which history has to be the father of ballooning, thanks to the invention of his Passarole. He died at Toledo in a state of insanity, when he had fled from the ire of the Holy Office. I have always thought that one must be full of a creative madness to write the way it is composed this novel. It is a sheer original, brilliant and spellbound novel. I was tightly and irrevocably encapsulated by the read from page one. And for sure it didn’t have anything to do with the full moon phenomenon which was happening just this very last weekend…by the time I actually finished it. ≪ Dom Jo I have always thought that one must be full of a creative madness to write the way it is composed this novel. It is a sheer original, brilliant and spellbound novel. The story gravitates around the creation and building of a Flying machine (the so-called beloved Passarola), enterprise which eventually comes to a successful fruition and, which is going to lead to some dramatic consequences for this trinity of airship inventors, and, on a larger scale, on the construction and erecting of the convent of Mafra, a highly ambitious and hard-labouring project which affects eventually the overall population of the country, because events are always interconnected and no one can escape from the eye of the Church (with the high supervision of the Holy Office of the Inquisition) and the State (as per the King’s decrees..). I’ve found thoroughly absorbing the whole exuberance of the baroque narrative, blended with cascading discourses and meditations on human existence, religion, criss-crossed questions between intellect and faith on life’s governing, all flavoured by a comedy, erudite, sometimes surreal writing style of counting the stories that make up for people’s lives… In the end, Always as something, never as everything, and never as nothing. For, after all, we can escape from everything, but not from ourselves. Este foi o primeiro livro de Saramago que li e não será, certamente, o último. Apaixonei-me pela escrita deste tão conceituado autor, verdade seja dita. Como se costuma dizer: "primeiro estranha-se, depois entranha-se" e eu tive de adotar os meus métodos para que isso acontecesse. A minha própria mãe presenciou alguns momentos embaraçosos de leituras e releituras em voz alta de diálogos confusos... Mas sobrevivi e adorei a experiência. Começamos pelo Baltasar e pela Blimunda? A Bem, cá vamos nós. Começamos pelo Baltasar e pela Blimunda? A mim, parece-me bem... Adorei a relação destes dois. Um amor ingénuo, puro e cativante que traz ao de cima o melhor dos corações humanos. Se sofri com o final? Oh meus caros, eu tenho um grave problema com personagens fictícias e quando já me tinha conformado com o desfecho da história, o narrador decide lançar a "bomba" nos dois últimos parágrafos. Não soltei nem uma, nem duas nem mesmo três lágrimas... foram aos pares como se elas tivessem sofrido e não se quisessem abandonar umas às outras num momento tão (...) emotivo. Blimunda e Baltasar, Sete-Luas e Sete-Sóis ficarão para sempre guardados na minha memória. Quanto ao aspecto crítico da obra... Adorei ler a partir da perspectiva deste narrador tão perspicaz e inteligente. O notório tom sarcástico e ironia propositada em algumas passagens textuais não me seguraram umas boas e agradáveis gargalhadas. A descrição não podia ser mais ousada e adequada ao contexto social da época e o mais interessante, a meu ver, foi sem dúvida o relevo dado aos que vivem na sombra deste Portugal entorpecido da primeira metade do século XVIII. Um povo que vive na penúria, que luta por um país cujo rei usa e abusa do poder lhe fora concedido para satisfazer o seu "pequenino" ego. Uma grande vénia a este senhor... Muita pena tenho eu de só agora dar valor a este fantástico escritor português! Palmas! Za svoj prvi prikaz knjige na ovom sajtu sam izabrao, po mom mišljenju, najznačajnije literarno delo dvadesetog veka, u neku ruku skrajnuto, iako ovenčano nagradama, stilski i strukturalno za koplje prevazilazi maestralni „Sto godina samoće“ Saramagove velike zvezde vodilje Markesa (iako to nikada nije javno priznao). Takođe treba napomenuti da sam ovaj prevod čitao u izdanju sada već nepostojeće kuće „Lingua Franca“ u prevodu detaljnog i posvećenog Dejana Tijaga Stankovića koji je svoj život pos Za svoj prvi prikaz knjige na ovom sajtu sam izabrao, po mom mišljenju, najznačajnije literarno delo dvadesetog veka, u neku ruku skrajnuto, iako ovenčano nagradama, stilski i strukturalno za koplje prevazilazi maestralni „Sto godina samoće“ Saramagove velike zvezde vodilje Markesa (iako to nikada nije javno priznao). Takođe treba napomenuti da sam ovaj prevod čitao u izdanju sada već nepostojeće kuće „Lingua Franca“ u prevodu detaljnog i posvećenog Dejana Tijaga Stankovića koji je svoj život posvetio portugalskom jeziku. Lagunino izdanje ne mogu da komentarišem jer ga nisam i nikad neću imati u rukama. Uvodna greška svakog opisa jeste da je ovo istorijski roman, što samo govori o površnosti većine čitalaca. U pitanju je ljubavni roman i to još najlepše i najkompleksnije ljubavne priče (kako sam autor potvrđuje u intervju za Paris Review iz ’98 godine). U nemogućnosti da se bilo koje Saramagovo delo opiše, da se predstavi publici, leži dokaz njegovog genija. Baltazar i Blimunda (kako glasi originalni naziv ovog dela) je sam vrh njegovog virtuoza, od svojevrsnog stila, koji je i u mom pisanju napravio snažan zaokret, do suptilnog razvoja likova, brišići granicu između tragedije i komedije, sve to uvijajući u istoriske i društvene činjenice koje ovde služe samo kao potpora priči kao najsvetlijem primeru magičnog realizma. Ne smemo ni izostaviti iz vida da je Saramago predvodnik evropskog skepticizma u modernoj literaturi, dajući nasleđenom latinoameričkom realizmu dozu ironije, skoro gađenja prema nasilnom evropskom napretku, probadajući ga višeslojnim prikazima kontradikornosti. Παραδόξως για τον αγαπημένο Σαραμάγκου, κάτι δεν πήγε καλά από την αρχή. Γοητευτικός με τον δικό του ξεχωριστό τρόπο! Εξαιρετικό. I often thought that books can inspire you to travel. But these last two books by Saramago, "El año de la muerte de Ricardo Reis" and "Memorial del convento" have given me a different feeling. After traveling to Portugal last year, both books have become even more real after seeing many of the places visited. Both books have painted different periods of history in Portugal, the early twentieth century in Ricardo Reis; the early eighteenth century in Memorial. Both are amazing tales of the human spirit and I read both in Spanish (apologies for not reading in Portuguese...it does take awhile to master another language). A special thanks to João Carlos for sending me the top twenty five Portuguese Books. Memorial do Convento rings in at number eight and I can see why. In its heart, this is a love story between Baltazar and Blimunda (also the title in English). Baltazar is a soldier who lost his left hand after the war, returns to Lisbon where he meets Blimunda, who just had her mother sent away to Angola. 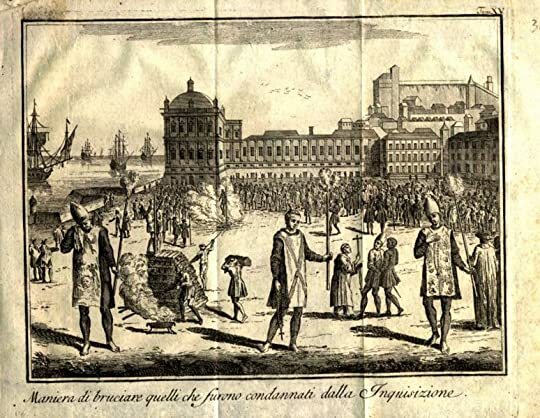 This is the time of the Inquisition (auto de fé) and crowds are needed to see the latest victims (two women are also burned to death). Both have lost something and their love begins immediately. Blimunda has the ability to see inside a person and needs to eat bread before opening her eyes every morning. Is she a witch? A non-believer? They become inseparable. They are given nicknames, Baltazar is Seven Suns because he can see clearly; Blimunda is Seven Moons because she she can see in the dark. " During the night the sun and moon embrace, while the stars turn slowly in the sky. The Moon, from where you came; the Sun, to where you are going. ("Tú eres Sietesoles porque ves a las claras, tú serás Sietelunas porque ves a oscuras, y así, Blimunda, que hasta entonces sólo se llamaba, como su madre, de Jesús, acabó siendo Sietelunas, y bien bautizada estaba, que el bautismo fue de cura, no un apodo cualquiera. Durmieron aquella noche los soles y las lunas abrazados, mientras giraban las estrellas lentamente en el cielo, Luna dónde estàs, Sol, adónde vas." (P. 107) You can't get more beautiful than this. Wrapped around this couple are two other stories: the building of the Convent at Mafra and the concept of the passarola, one of the earliest flying machines. The spectacular convent was built by King João V when the queen bore him a daughter. Baltazar gets work at the convent and Saramago spares nothing describing the brutal job for thousands to build this massive project. It made many employees and yet the hardships were many. Under Saramago's acute and often sarcastic eyes I have to admit that I took on a new respect for many of the landmarks that I saw in Europe. The king utters, "Give to Caesar what is from God and give to God what is from Caesar and after we will tally the money, some for me, some for God" (Di al César lo que es de Dios, y a Dios lo que es del César, después haremos las cuentas y partiremos el dinero, un chavo para ti, otro para mí, en verdad os digo y diré, Y Yo, vuestro rey, de Portugal. p.190). Or when the German architect addresses the wealth of the king, he notes the endless money entering the mouth and leaving "...eso es lo qué pasa en Portugal, que es un saco sin fondo, le entera el dinero por la boca y le sale por el culo... (p. 349) Perhaps less of a beautiful sight. I picked up this book while traveling through Portugal this fall. Last summer, I read my first Saramango book, Blindness, and loved it. Walking along the riverfront in Lisbon, I ran into the José Saramango Foundation where there was an exhibit on his work and that of the famous Brazilian author Jorge Amado. It was as though I were a kid in a candy store! There were thousands of Saramango books in the library, and the bookshop carried many of his major works; unfortunately, it only had one in en I picked up this book while traveling through Portugal this fall. Last summer, I read my first Saramango book, Blindness, and loved it. Walking along the riverfront in Lisbon, I ran into the José Saramango Foundation where there was an exhibit on his work and that of the famous Brazilian author Jorge Amado. It was as though I were a kid in a candy store! There were thousands of Saramango books in the library, and the bookshop carried many of his major works; unfortunately, it only had one in english. I asked the attendant which was her favorite and she said, without hesitation, “Memorial do Convento” ( the original title for Baltasar and Blimunda). This was, per her knowledge, what made Saramango famous in Portugal. I picked up a Spanish translation, as my knowledge of Portuguese is nonexistent. The Memorial do Convento is a wonderful portrait of eighteenth century Portugal. As in the typical Saramango style, there is a mixture of reality, history, fantasy, humor, and endless descriptions of contextual facts and surroundings. For those new to Saramango, there will be the initial uphill battle of deciphering and decoding sentences four or five pages long, a lack of paragraph indentation and periods, and a plethora of commas separating dialogues, questions, and answers, of one to various characters– Saramango leaves it up to the reader to identify the speaker. Sometimes, one has to finish a pages-long sentence and re-read it to finally grasp the idea, all this being a surprisingly addictive exercise of the mind. I must confess, though, that I found his complex style frustrating initially; I blamed the translations (so far I have read Blindness in French and this one in Spanish) and often doubted my capacity to understand what I read. After finally overcoming these frustrations, I must confess that I am now totally hooked on this style. How can I go back to reading orthodox literature with beautiful, easy, and predictable punctuation; long pauses to rest the mind between paragraphs and take a breath between numbered chapters as opposed to this breathless marathon of words, flight of ideas, numerous characters and circumstances dancing around endlessly between commas, and the constant demand to figure out who said what or whether it happens now, it already happened, it will never happen, or is it only a dream?!!!! Without a doubt, I will choose the latter –a thousand times over. "Deve-se a construção do convento de Mafra ao rei D. João V, por um voto que fez se lhe nascesse um filho, vão aqui seiscentos homens que não fizeram filho nenhum à rainha e eles é que pagam o voto, que se lixam..."
E foi assim: sob o pretexto de contar como surgiu o convento de Mafra, Saramago escreveu um livro que tem o sabor inigualável das histórias contadas pelos antigos, com muita astucia e imaginação. História com provérbios e lições de moral à mistura, trocadilhos e metáforas usados de f "Deve-se a construção do convento de Mafra ao rei D. João V, por um voto que fez se lhe nascesse um filho, vão aqui seiscentos homens que não fizeram filho nenhum à rainha e eles é que pagam o voto, que se lixam..."
E foi assim: sob o pretexto de contar como surgiu o convento de Mafra, Saramago escreveu um livro que tem o sabor inigualável das histórias contadas pelos antigos, com muita astucia e imaginação. História com provérbios e lições de moral à mistura, trocadilhos e metáforas usados de forma generosa. Fê-lo com fino sentido de humor, com subtil ironia, direto e cru, sem se incomodar por ferir suscetibilidades. Criticou a nobreza pela opulência exagerada e pelos gastos descontrolados sem ver à sua volta a miséria dos pobres, sem se incomodar que a uns faltasse e a outros sobrasse. Foi hábil a caricaturar a igreja e a sua hipocrisia. A inquisição, a ganância e luxuria dos clérigos que tanta moral pregavam, mas que usavam a sua posição de missionários (ups!) para o bom manejo da sua economia e para satisfação das suas necessidades pessoais. Por vezes divaga, antecipa o futuro das personagens, encadeia acontecimentos ou figuras que a principio não se percebe bem a razão de estarem ali... fica-se à nora -" mas do que está ele a falar agora?!" - é preciso ler devagar para não nos perdermos nesta sua peculiar forma de escrever. Poder-se -ia pensar que é uma narrativa fruto do improviso - vai pensando, vai escrevendo, comentando o que escreve - não fosse fácil subentender a pesquisa e o conhecimento histórico que dá origem a este genial derrame verbal que não olha a preceitos de escrita. Finalmente - Baltazar e Blimunda, o par amoroso da história. Os anti-heróis; imagem de um povo espezinhado e oprimido. Corajosa e persistente Blimunda, destemido e humilde Baltazar. Nada tinham de seu, mas foram o sonho, a magia, o amor grandioso. A vida não lhes deu nada. Deram-se um ao outro. É um livro portentoso, dos que ficam num lugar privilegiado da nossa memória. Não são muitos os que lá tenho, mas são todos especiais e inesquecíveis. I love almost everything related to the European Middle Ages and this novel was one of the best I've ever encountered on the topic. It helped me explore more about Portuguese culture, as well, and intrigued to go even deeper into it. I loved the story of Father Lourenço Bartolomeu, the real historical figure who invented a flying machine in the early 1700s, and the way it blends into the lives of the other main characters. I loved the mysticism blended with the vulgar and the realism of Portugue I love almost everything related to the European Middle Ages and this novel was one of the best I've ever encountered on the topic. It helped me explore more about Portuguese culture, as well, and intrigued to go even deeper into it. I loved the story of Father Lourenço Bartolomeu, the real historical figure who invented a flying machine in the early 1700s, and the way it blends into the lives of the other main characters. I loved the mysticism blended with the vulgar and the realism of Portuguese social life of the late medieval period. I also loved the fact that the cornerstone of the novel is a love story between two very working class characters. Their worldview is touching and extremely interesting, insofar as it reveals what the Portuguese peasant thought of the world. HEADLINE: Being John Malkovich . . . . Excuse me. . . .I mean, Being José Saramago. As I mentioned once before, I have given up that tedious worry as to whether the book in translation that I am reading is a faithful translation of the original or not. The book in front of me in English is either a dandy or it is not. I no longer care whether it bears any resemblance to the original. I will let others tease that out. Baltasar and Blimunda in English is one of those dandies. It is perfectly consist HEADLINE: Being John Malkovich . . . . Excuse me. . . .I mean, Being José Saramago. Baltasar and Blimunda in English is one of those dandies. It is perfectly consistent with my other very limited background launching out into the experience of an Iberian writer or a Latin American writer. Marquez, Cortazar, Borges, Saramago, Eduardo Galeano from Uruguay, a very few others, and even Cervantes. It is always a “fasten your seatbelt” kind of experience. Now that I have overcome that hangup about reading in translation, I intend to broaden that experience. although it may also come to pass that everything will end with a general amnesty or universal punishment, all that remains to be known is who will pardon or punish God. the royal party drove past looking solemn, grave, and imperious without so much as a smile, for God himself never smiles, and He must have His reasons, who knows, perhaps He has ended up feeling ashamed of this world He has created. It takes a bit for one to get one's sea legs in this world. When one first encounters the concept of capturing human "wills" with which to power the flying machine, one is a initially a bit disoriented. But aside from the weighty message of that, one soon becomes used to the idea in a matter-of-fact way. This image, for lack of a better word, is one of those that permeates the whole novel. There came the chapter for me well into the book devoted to the auto-da-fé. It starts with an explanation of why Doña Maria Ana will not be able to attend and a description of the sumptuous feast that the King and Chief Inquisitor will enjoy after the ritual slaughter (51 men and 53 women). There is a nice description of the nature of this festivity. Then Sete-Sóis and Blimunda meet for the first time as they watch her mystic mother take a flogging. Shortly thereafter, our friend Padre Bartolomeu marries them on the spot, and the chapter closes with Blimunda making the sign of the cross on Sete-Sóis' chest "near his heart" with her own blood after losing her virginity. Imagery. That common, withered, English Major word is re-informed by this novel. Interest in other aspects of the novel depends to some extent in whether one develops a fascination with the history of Iberia and Portugal in particular. João V's involvement in the War of Spanish Succession, his extravagant attempts to emulate the splendor of Louis XIV's court in France, and his fixation on proving himself the most Catholic of all Kings are things that will turn back a fair number of readers. As one approaches the end of the book, one reads about the construction of Dom João V's huge convent. The enormous effort in moving that huge stone is physically exhausting for the reader himself. I found this the most vivid and entertaining part of the novel. The novel takes on the air of an epic in that section. However, the portrayal of the royal procession is also a comic masterpiece. Ultimately, even the King finally realizes that death will render it all meaningless. He will not be alive when, and if, the convent is finally completed. What must it be like to inhabit José Saramago's brain? This novel is an exploration of it. My 5th Saramago book and I have always been bewildered as ever. Every book by him seems to be a totally different idea. He seems to have never rewritten himself. I first started with his Blindness (3 stars) about people going blind and the world turning post-apocalyptic and this was followed by his 1001 book, The Double (4 stars) that reminded me of an instance when I myself saw a man one morning who looked like exactly like me. Then the following year, 2011, I read his The Gospel According to J My 5th Saramago book and I have always been bewildered as ever. Every book by him seems to be a totally different idea. He seems to have never rewritten himself. I first started with his Blindness (3 stars) about people going blind and the world turning post-apocalyptic and this was followed by his 1001 book, The Double (4 stars) that reminded me of an instance when I myself saw a man one morning who looked like exactly like me. Then the following year, 2011, I read his The Gospel According to Jesus Christ (3 stars) for my Lenten read. Then when the new 1001 books edition came up in 2012 and saw another book by him making it to the list, I read Caim (4 stars) right away. Baltasar and Blimunda is a love story so it is a good book for Valentine's Day. The man is Baltasar a soldier who lost his left arm during Portugal's battle with Spain. Out of service, he meets Blimunda who psychic maiden who sees the inside of the people and who eats only bread and when she eats she closes her eyes. 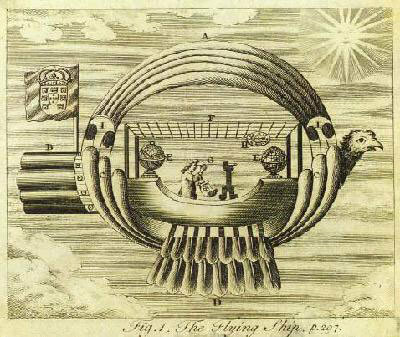 They were already a couple when they met Father Bartolomeu de Gusmao (1685-1724) who in Portugal during his time was the pioneer on "lighter-than-air" airship design. During his time, the Inquisition was still on and because of Father Gusmao's inventions, not only this flying machine but other inventions as well, he was tried and found guilty of heresy. Inquisition was one of the dark periods in the history of the Catholic Church when the supposedly holy people kill suspected people who are making facts with the devil so even Galileo was tried of heresy when he said that the world was round and not flat as the Catholic religious used to believe. The writing is distinctively Saramago with very few periods and punctuations. Not totally almost bereft like his writing in Blindess but more enjoyable compared to it primarily because it is a historical love story that reminded me of Ken Follett's The Pillars of the Earth (3 stars) one of the earliest books I've read when I was already a Goodreads member. The book at times also felt similar to Umberto Eco's The Name of the Rose (4 stars) minus its philosophical musings. The plot is not as exciting as "Pillars" and not as profound as "Name of the Rose" but definitely memorable because of its milieu: the time when Inquisition was rampant in Portugal and the idea of the flying aircraft was still an unknown. I took a long while to finish this book because I have been too busy in the office since one of my subordinates resigned. However, I saw to it that I read at least 5 pages everyday as I wanted to know what will eventually happen to the lovers, Sete-Sois (Baltazar) and Sete-Luas (Blimunda). There are very few love scenes and they are not as explicit as I thought Saramago would go but they did not lessen my enjoyment of reading everything. I just prodded and went on and on until the last page. La scrittura di Saramago è una delle più belle, coinvolgenti e complesse che io abbia mai incontrato. Non è semplice. Cominciare a leggere Memoriale del convento è un po' come entrare in un paesaggio ricco, ricchissimo, denso, a cui il nostro occhio deve fare l'abitudine per poter cogliere tutti gli elementi, perché non può bastare un colpo d'occhio con Saramago, assolutamente no. Ogni frase, a volte ogni termine utilizzato, ha un valore non da poco, e cela uno stile affascinante, un uso disinvo La scrittura di Saramago è una delle più belle, coinvolgenti e complesse che io abbia mai incontrato. Non è semplice. Cominciare a leggere Memoriale del convento è un po' come entrare in un paesaggio ricco, ricchissimo, denso, a cui il nostro occhio deve fare l'abitudine per poter cogliere tutti gli elementi, perché non può bastare un colpo d'occhio con Saramago, assolutamente no. Ogni frase, a volte ogni termine utilizzato, ha un valore non da poco, e cela uno stile affascinante, un uso disinvolto e non sempre chiaro di un'ironia eccezionale, grazie alla quale la Storia viene ricostruita, reinventata, schernita e un po' demitizzata. Alla storia di Baltasar e Blimunda, Saramago riserva invece la sua prosa più poetica, e un occhio quasi di riguardo, riuscendo a creare una storia d'amore intensa e quasi perfetta senza scadere mai nel già-visto, nel banale. Um dos melhores exemplos do realismo mágico na literatura portuguesa. Sob o olhar acutilante de José Saramago, o leitor é transportado para o reinado de D. João V, mais precisamente para o período da construção do Convento de Mafra. Narrando a bela história de amor entre Baltasar e Blimunda, o autor mostra também a sua compaixão para com os sacrificados em nome do capricho do rei. Aliado a um profundo conhecimento da alma humana e a uma atmosfera onírica, este é um dos melhores romances históric Um dos melhores exemplos do realismo mágico na literatura portuguesa. Memorial do Convento é mais uma das obras-de-arte de Saramago. A relação entre Baltasar e Blimunda traz-nos uma quietude interior inversamente proporcional ao assombro que nos causa a narração da edificação das Grandes Obras, reais e divinas. Acho que a maioria das pessoas começa a ler o Nobel por este livro, pois está no Programa do Ensino Secundário, mas acho que não é o ideal para iniciar a conhecer o autor, pois tem linguagem antiga, relativa à época que retrata, e é bastante extenso. Felizmen Memorial do Convento é mais uma das obras-de-arte de Saramago. Felizmente, ainda me faltam ler algumas das maravilhas deste autor. Não serão precisos conventos para fazer perdurar a memória de Saramago.. Bastam as suas palavras. Cheguei ao fim, mas a vontade é de regressar à primeira página e voltar a ler tudo ainda com mais tempo, sorvendo cada detalhe desta obra maravilhosamente bem escrita. O Memorial é de uma oralidade incrível e por isso a velocidade de leitura (para quem não tem problemas com a falta de pontuação dita "normal") pode ser alucinante. Isso pode, no entanto, levar o leitor a perder detalhes da narrativa que eu não quis de todo perder. A beleza da narração é brutal, mesmo as cenas que podem ser consider Cheguei ao fim, mas a vontade é de regressar à primeira página e voltar a ler tudo ainda com mais tempo, sorvendo cada detalhe desta obra maravilhosamente bem escrita. A beleza da narração é brutal, mesmo as cenas que podem ser consideradas cruéis - como a determinada altura a descrição da morte de um dos trabalhadores - são muito bonitas. Devo confessar que não sou fã de romances históricos mas este captou-me do início ao fim, deixou-me com uma vontade enorme de ir a Mafra, à Ericeira e a toda a zona em redor... e claro visitar o Convento e ver (principalmente!!!) a tal pedra que tanto trabalho deu a transportar para a obra. E no final desta leitura dei por mim a perguntar-me: "por que raio nunca tinha pegado neste livro? Afinal de contas esta é a 56a edição!!" Aconselho a todos os amantes de boa literatura portuguesa. Recommends it for: Saramago afficionados! King João V desperate to beget a child, a prince, makes a vow to the Capuchin friars at Mafra that should his wife Queen Mariana get a child he would built a Convent for the Friars. He does get a Child and the Convent of Mafra was his way of repaying the vow. If ever I visit Mafra in Portugal, I will know and see the hardship that went into building the Convent. Transporting huge blocks of marble from the quarry to the site of the convent is for want of a better word, back breaking. Whenever I lo King João V desperate to beget a child, a prince, makes a vow to the Capuchin friars at Mafra that should his wife Queen Mariana get a child he would built a Convent for the Friars. He does get a Child and the Convent of Mafra was his way of repaying the vow. Whenever I look and admire all the monuments erected in the name of religion, I wonder is it worth it? The exact site was chosen in 1713 and purchased in 1716. Construction began by the laying of the first stone on November 17, 1717 with a grand ceremony in the presence of the king, his entire court and the Cardinal Patriarch of Lisbon. Initially it was a relatively small project for a friary of 13 Capuchin friars, who were to observe strict poverty. However, when the flow of gold from the Portuguese colony of Brazil started to arrive in Lisbon in abundance, the king changed his plans and announced the construction of a sumptuous palace along with a much enlarged friary. This immense wealth allowed to king to be a generous patron of arts. He appointed a German goldsmith Johann Friedrich Ludwig, called by the Portuguese, João Frederico Ludovice, as his architect. Ludwig had studied architecture in Rome and knew contemporary Italian art. The extent of Ludwig's responsibility is unclear, as several other architects were involved in this project, the Milanese builder Carlos Baptista Garbo, Custódio Vieira, Manuel da Maia and even his own son António. However the application of the same architectural style over the whole building suggests the work of Ludwig as the head-architect in charge of the Royal Office of Works (Real Obra). Construction lasted 13 years and mobilized a vast army of workers from the entire country, a daily average of 15,000 but at the end climbing to 30,000 and a maximum of 45,000, under the command of António Ludovice, the son of the architect. In addition 7,000 soldiers were assigned to preserve order at the construction site. They used 400 kg of gunpowder to blast through the bedrock for the laying of foundations. There was even a hospital for the sick or wounded workers. A total of 1,383 workers died during the construction. The facade is 220 meters long. The whole complex covers 37,790 m² with about 1,200 rooms, more than 4,700 doors and windows, and 156 stairways. When complete the building consisted of a friary capable of sheltering 330 friars, along with a royal palace and a huge library of 40,000 books, embellished with marble, exotic woods and countless artworks taken from France, Flanders and Italy, which included six historical pipe organs and the two carillons composed of 98 bells. The basilica and the convent were inaugurated on the day of the King's 41st birthday on October 22, 1730. The festivities lasted for 8 days and were of a scale never seen before in Portugal. The basilica was dedicated to Our Lady and to St. Anthony. However the building was not finished. The lantern on the cupola was completed in 1735. Work continued till 1755, when the work force was needed in Lisbon to assist in the devastations of the Lisbon earthquake. An 'intellectual hodgepodge' is the best term I could come across to describe the book. However, as I put this, I should also abnegate further connotations, which could be possibly evoked by the suggested tag, no matter what that supposed connotations would be: positive or negative. This is a book embracing magical realism and socialist realism at once, even though there is a romantic thread running all across the text and one might even say that this is a simple love story. Anyway, I certainly r An 'intellectual hodgepodge' is the best term I could come across to describe the book. However, as I put this, I should also abnegate further connotations, which could be possibly evoked by the suggested tag, no matter what that supposed connotations would be: positive or negative. This is a book embracing magical realism and socialist realism at once, even though there is a romantic thread running all across the text and one might even say that this is a simple love story. Anyway, I certainly recommend the book; there you can find picturesque description of early 18th century Portugal, a new standpoint to see the Lenten procession of penitents, and the march of enslaved peasants conscripted to work on the royal oath, which is going to be the convent of Mafra. There you can perceive the contrast between different points of views, i.e. those of rulers and those of ruleds; you will encounter dramatized historical characters, viz. Padre Lourenco and maestro Scarlatti; and finally you'll come up against several symbols to be unveiled, e.g. the big bird Passarola and the mystery of how it is fueled with human wills to fly toward the celestial dome, whereto the holly office of inquisition never looks. However, the book is not an easy one to read, sentences are pretty much large and there are no punctuations save for concurrent commas and points. The interlocutors are not explicitly denoted and sometimes the reader has to read back and forth to fully grasp the ideas. It takes time to be read; yet, I can tell, the reading of the book is worthy of the spent time. داستان در ارتباط با عشق بالتازار هفت خورشید و بلیموندا هفت مهتاب است عشقی که تا سال های پیری هم چنان عمیق و ماندگار است. این زوج توانایی های خاص و ویژه ای دارند بالتازار با اینکه یکی از دستانش را در جنگ از دست داده مردی قوی و با اراده است و از پس هر نوع کار سنگینی بر می اید و بلمیوندا زنی است با چشم های متفاوت او می تواند درون انسان ها را و ماهیت هر چیزی را ببیند. مفاهیم فلسفی به زیبایی در لابلای داستان مطرح شده است طوری که خسته کننده نیست و به زیبایی آن افزوده است. نویسنده به وضوخ از تفاوت بین ثر داستان در ارتباط با عشق بالتازار هفت خورشید و بلیموندا هفت مهتاب است عشقی که تا سال های پیری هم چنان عمیق و ماندگار است. این زوج توانایی های خاص و ویژه ای دارند بالتازار با اینکه یکی از دستانش را در جنگ از دست داده مردی قوی و با اراده است و از پس هر نوع کار سنگینی بر می اید و بلمیوندا زنی است با چشم های متفاوت او می تواند درون انسان ها را و ماهیت هر چیزی را ببیند. اولین کتابی بود که مدت زیادی طول کشید تا تمومش کنم ولی فک میکنم آناخوسیفا کتابی است که باید با آرامش و تامل بیشتری خوانده شود تا فرصت بیشتری برای تامل و تفکر درباره ی موضوعات و مفاهیم آن داشته باشیم. Lisabon zaudara, zaudara na trulež, a miris tamjana daje nekakav smisao ovome smradu kvarnosti ljudskih tijela, jer duša je miomirisna. Saramagov stil pisanja miluje oči i dušu poput kakvog delfina koji miluje more. Poslije ove knjige osjećam sve veću potrebu da ga čitam. U početku je bilo teško čitati ga i mislio sam da zadugo neću završiti knjigu, a onda malo po malo počeo je da otvara vrata u neka prostranstva, koja su surova, ali istovremeno i lijepa, a koja takođe daju neke poglede na određe Lisabon zaudara, zaudara na trulež, a miris tamjana daje nekakav smisao ovome smradu kvarnosti ljudskih tijela, jer duša je miomirisna. Sinceramente? Não estava à espera de gostar tanto. Demorou mas já está! Li o Memorial do convento todo! Quanto à leitura: Altos e baixos, partes secantes, as primeiras 200 páginas foram canja, depois ali para o fim começou a ser uma seca total, só queria passar à frente. Gostei muito da Belimunda e do Baltasar! Agora estou super feliz porque vou fazer uma visita de estudo a Mafra, quero descobrir mais sobre esta obra! 5 meses Sinceramente? Não estava à espera de gostar tanto.